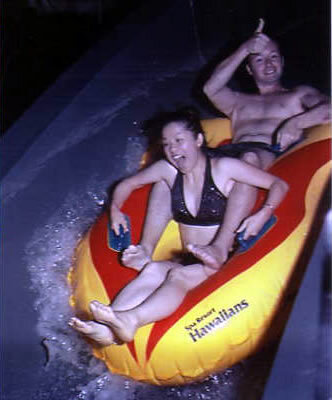 Why spend thousands of dollars on a vacation to Hawaii when you can go to a Hawaiian based theme park only a couple hours from Tokyo? Well ok to be honest I never actually had that thought, but when a student of mine told me about this resort which his company owns, I was interested, and when he said he could get me a discount I was like, 'ok sign me up'! 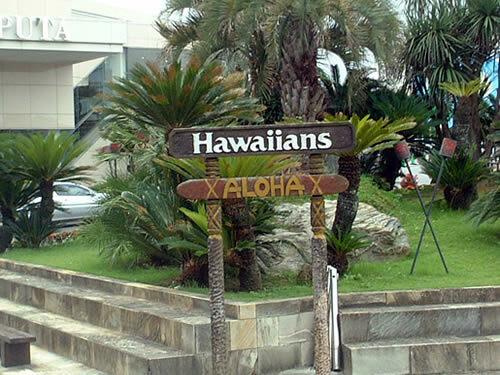 Spa Resort Hawaiians is located about 2.5 hours from Tokyo by bus in the town of Iwaki in Fukushima prefecture. Upon pulling into the palm tree laden resort we are greeted in Hawaiian. Good start. There were several available hotels to stay at, and ours was called Vir Port. 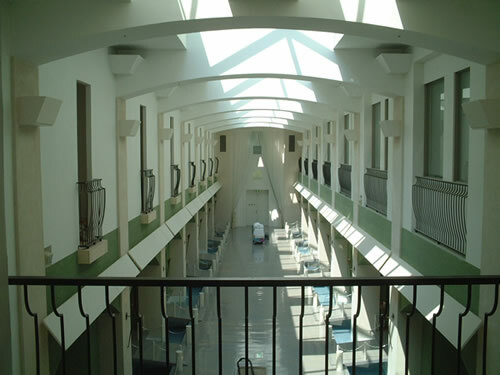 Soft white walls, metal bars everywhere, not unlike a mental institution Kumi and I thought. Apparently the builders were trying to emulate the inside of a cruise ship. Not having ridden a luxury boat, the impression was lost on me. Are we in Hawaii yet? All was forgiven upon entering our room though. It seemed that regular room reservations were difficult to come by seeing how it was high season. The presidential suite however, being more expensive than the others, was available. The room was so amazing, Kumi and I considered just spending the whole time hanging out in there. 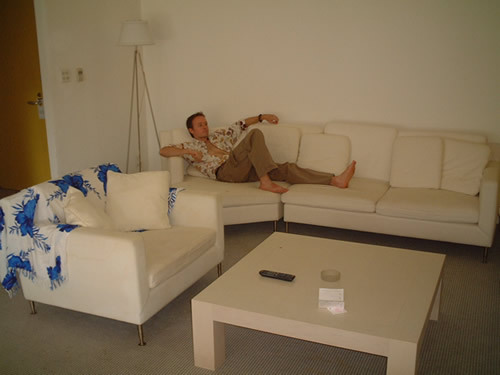 Here's me living the good life on the six person sofa. What did I tell you? The bathroom alone was bigger than my apartment. 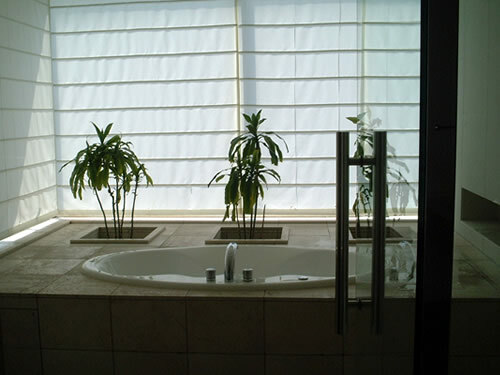 Two sinks, a separate toilet also with it's own sink, a shower, massive closets and to top it all off, a jacuzzi for two. 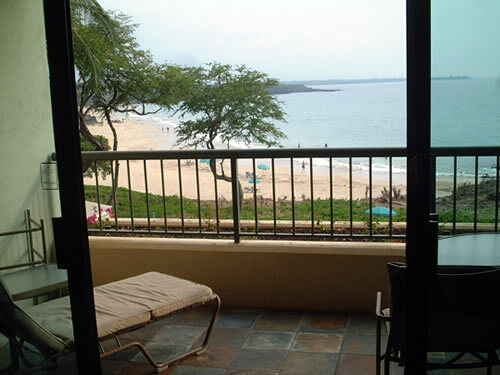 Ours was the only room with a balcony, and what a balcony it was! I little oasis of calm overlooking the parking lot which you can see is pretty darn full. I stood at the railing like a king overseeing his domain. When people walked by and looked up I could see the wonder in their eyes as they gazed upon the man (and woman) who dared stay in the best room in the hotel. No autographs please. Remember how I said that I wanted to spend the day chillin in our room? All those cars in the parking lot weren't there just for show, this place was packed! 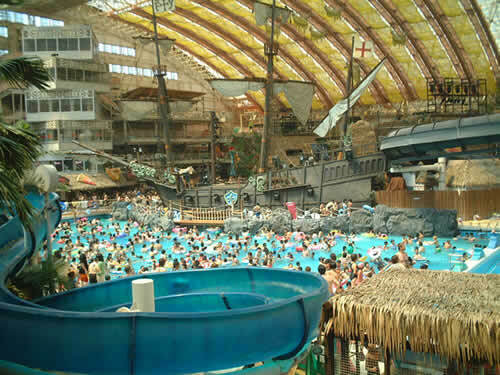 The main part of the resort features a huge waterpark with pools, slides and other amusing water-based things. All of them look as fun as can be, except when you add a few thousand people. One of the attractions was a dounut shaped pool which has water flowing around in one direction like a river. I've been in one before with few people and it's fun to swim along with, or fight against, the current. The one pictured here though was so full that all you could do was slowly walk around, and get shoved and elbowed from behind. Kumi and I dubbed it the prisoner's walk of shame. Jail is getting to be a common theme here isn't it? Here's the main pool. Not much to do in here except stand around.... Nice boat in the background, but you could neither board it it or jump off it. Kumi and I decided to head back to our rooms and wait a while for the crowds to thin out. Good idea that. We returned around 6pm to find about half the people gone. Now the lineups for the waterslides were only a 20 minute wait instead of 50 and it was possible to stick your elbows out in the riverpool. Most of the waterslides were for kids, but there were a couple of good ones. Turns out that Kumi is kind of chicken when it comes to rides, but I convinced her to go on the fastest one with me, one that hits speeds of 40km/h. I think she enjoyed it even though she told me after it scared her. As well as a plethora of pools, indoor and out, the resort also boasts a goodly number of onsen (hot springs), a must for any resort in Japan hoping to stay in business. 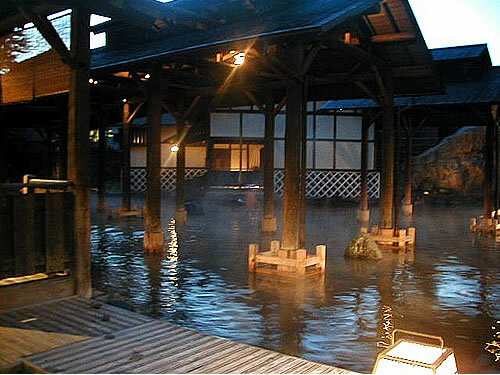 In fact, the biggest outdoor onsen in the whole country happens to be here. I went the next morning and lo and behold, i was the only person there! This is more like it! The food also deserves honourable mention. We ate buffet style for dinner, then the next day for breakfast and lunch as well, but it wasn't your usual crappy buffet, the food was good! Dinner especially. They gave you one main course, either filet mignon or lobster, plus all you could eat at the buffet as well. Of course all three times I ate until I was sick, gotta get my money's worth! So what's the verdict? 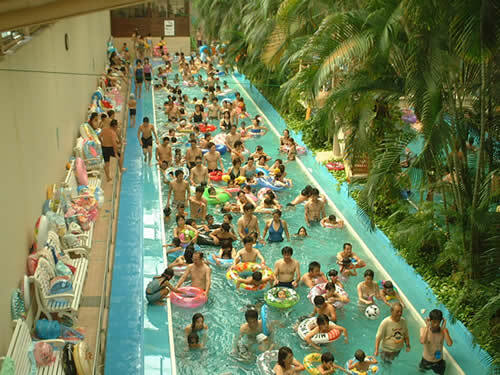 Well despite the crowds, and not having much resemblance to Hawaii, Spa Resort Hawaiians is still a decent place to go if you like water, chlorine and walking around all day in a bathing suit. Aloha!